Last edit: 15 Apr 2019 13:08 by Columbus450. Definitely agree with a possible timing concern. Which year of Expedition, specifically? A clear flood cranking test will likely make a compression problem obvious. 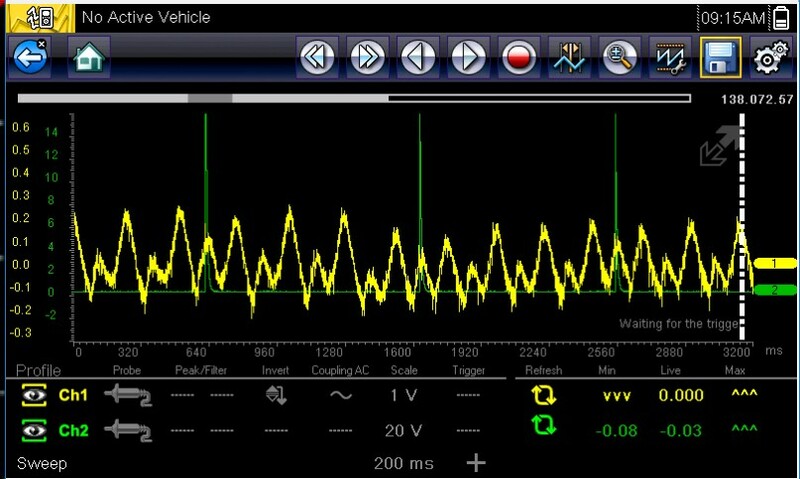 If this is a 4.6L without VVT, then it's possible to have a timing concern that can't be picked up by the PCM. Which O2 code was it? You can eliminate an O2 concern by noting of the engine runs badly while in open loop. Last edit: 15 Apr 2019 13:09 by Columbus450. As a general rule, most engines will take a bit before they transition from open to closed loop, while the PCM waits for the O2's to warm up. That means that if the engine is running on four cylinders immediately after startup, then it's likely ths O2's aren't involved in the problem. What does it sound like when you crank it during a clear flood test? A nice steady rhythm, or erratic? Last edit: 15 Apr 2019 18:06 by Columbus450. Oh yeah, definitely an inconsistency! Thank you for that video. A relative compression test with a scope and a sync on #1 would be best if you have a scope available. If not, I'd start with a compression test in one cylinder of each bank. If we're on the right track, the results should be obvious. Last edit: 15 Apr 2019 18:43 by Tyler. Pretty much any kind of amp clamp you have available can be made to work. If you don't have one handy, you can also do the same test with just voltage across the battery instead. Connect channel #1 with an alligator clamp to the battery positive post, and scope ground to battery negative. The scope setup is a different, but you'll get the same information. This is a capture I took off a Suburban with (obvious) compression issues. Since you have a Modis Edge, you can pretty much copy the settings for channel #1 and get in the ballpark. Channel #2 is gonna be different for you, since you're triggering off a COP instead of a plug wire. 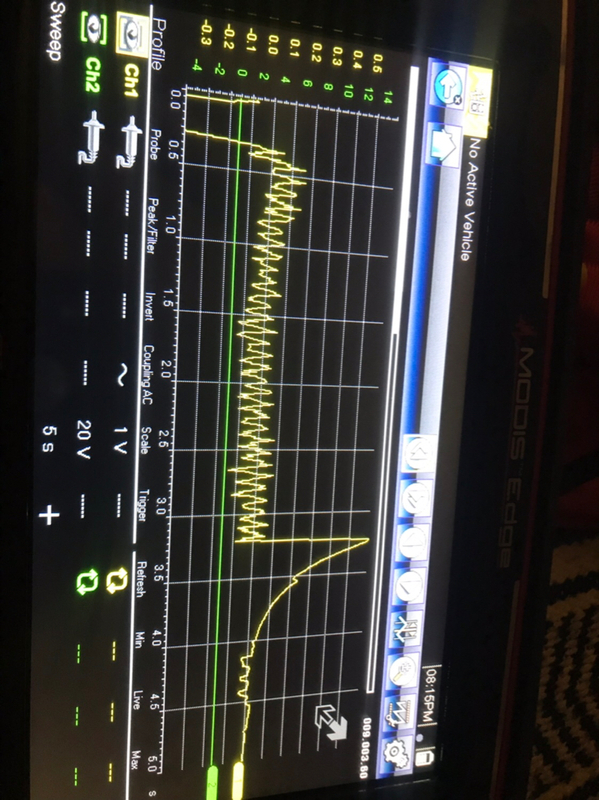 50 or 100V scale with Peak Detect is what you'll want. Wow ! !thanks so much for the info no I do not have a clamp available right now I did not know I could just put my lead on the positive side of the battery that is great I will do that for now and see what kind of reading I get ,since it is coil over plug so I just probe into the number one cylinder coil over plug, on the signal wire correct? Thanks a lot for the wave form!!! Yeah, backprobe the control wire on the #1 coil. Or any coil, really, as long as you know which one. The voltage relative compression is super handy when you don't have an amp clamp around, OR it's difficult to get the jaws of your clamp around the battery cable you want. I've been using it more and more. This on A known good vehicle with good compression this is the best I could get it to show up with a five second time base I tryed 200 but it was way too fast and close together how do you get the spikes to go so high up and down and more broad and wider?